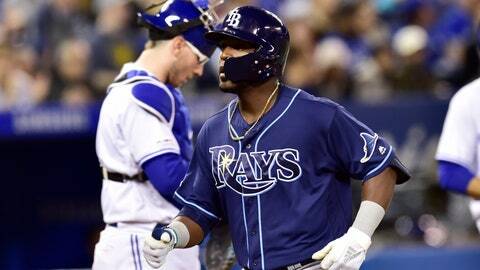 TORONTO (AP) — Baseball anonymity doesn’t bother the Tampa Bay Rays. Pinch-hitter Guillermo Heredia homered to cap a five-run burst in the eighth inning and the Rays beat the Toronto Blue Jays 8-4 Sunday for their fifth straight series victory to begin the season. Tampa Bay improved to 12-4 and matched the 2010 squad for the best 16-game start in club history. The small-market Rays may not be stacked with big-name stars, but they’ve already taken a big lead in the tough AL East, moving 5 1/2 games ahead of the New York Yankees. “We know our opposition, they know what they’re getting when they’re playing the Tampa Bay Rays and that’s all that matters. We’re dangerous,” he said. After losing their home opener to Houston, the Rays won three straight over the Astros and two of three against Colorado before hitting the road. Tampa Bay won two of three in San Francisco and swept a three-game set against the White Sox before crossing the border into Canada to collect their fifth series win. “Doing it two (series) at home and three on the road, I think that even magnifies it a little bit more,” manager Kevin Cash said. The Blue Jays have lost seven of nine and haven’t won a series this year. On a rainy day in Toronto, the grounds crew placed two buckets on the warning track in center field before the game to catch drops of water falling from the roof. Staff came out with towels and blowers to tend to the area again before the bottom of the fourth. Kiermaier, who chatted with the grounds crew when they came out to dry the field mid-game, said the damp spot wasn’t an issue for him. Blue Jays reliever Thomas Pannone became the 89th different pitcher in big league history to strike out the side on nine pitches. He fanned a swinging Avisail Garcia, then got Brandon Lowe and Daniel Robertson looking in the fifth. Steve Delabar (2013) and Roger Clemens (1997) also achieved the feat for Toronto. The Rays led 3-2 before breaking away in the eighth against a trio of Toronto relievers. Pinch-hitter Mike Zunino had a two-run single and Heredia added a two-run homer. “I know it got separated at the end but it certainly didn’t feel separated for six, seven innings,” Cash said. Adam Kolarek (1-0) pitched one inning for the victory. Billy McKinney, who had three hits, and Freddy Galvis homered for the Blue Jays. Rays right-hander Charlie Morton allowed one run and four hits in 4 2-3 innings. He has yet to give up more than four hits in any of his four starts this season. Toronto opened the scoring on Galvis’ single in the first but the Rays took advantage of a defensive miscue to tie it in the third. Ji-Man Choi reached with two outs when second baseman Lourdes Gurriel Jr. bounced a routine throw, sending it wide of first base. Choi advanced on a walk and scored on Brandon Lowe’s single. Gurriel, who also made a throwing error Saturday, was replaced by Alen Hanson the following inning. “He’s a young kid struggling mentally,” Blue Jays manager Charlie Montoyo said, adding a stint at Triple-A Buffalo might help Gurriel clear his head. Another Blue Jays error set up two runs in the fourth. Kiermaier ended up at second base on an errant throw by Marcus Stroman (0-3) to begin the inning. Willy Adames reached on an infield single and Michael Perez walked to load the bases before Austin Meadows and Yandy Diaz hit RBI groundouts. Stroman allowed three runs, none earned, in four innings. He walked four and struck out five. Rays: OF Tommy Pham got the day off. He has reached safely in a club-record 47 straight games, the longest active streak in the majors. Blue Jays: RHP Ryan Tepera (right elbow) allowed two runs and two hits, including a home run, in one inning at Triple-A Buffalo, his second rehab outing. The Rays used four outfielders and shifted another infielder into shallow right trying to deny Smoak in the seventh, but he still managed to single to right field. At 3 hours, 41 minutes, this was Toronto’s longest game of the season. Rays: Tampa Bay is off Monday before beginning a three-game home series against Baltimore on Tuesday. Rays RHP Tyler Glasnow (3-0, 0.53) boasts the AL’s lowest ERA. Baltimore has not announced a starter. Blue Jays: RHP Matt Shoemaker (3-0, 0.92) starts the opener of a four-game series at Minnesota. He has allowed two earned runs in 19 2-3 innings. LHP Martin Perez (1-0, 7.56) starts for the Twins.